Moustakia sarikia and stivania. Do you know what these are? There are just some traditions and habits that define a place and a people, and these moustakia sarikia and stivania are some of the things that give Crete her character. 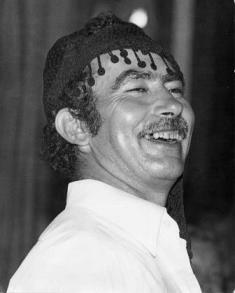 Firstly, you will notice many of the men wear moustaches moustakia, this is considered a very proud Cretan custom. 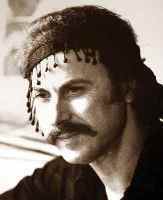 Above you can see Nikos Xilouris, one of the most beloved musicians of Crete, who of course had a moustache and here is wearing his sariki. Below you can see some of our fine Cretan friends, Michalis, Kostas, Nikos and Giannis, with their moustakia. 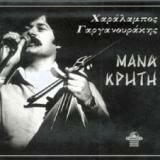 Garganourakis, a Cretan musician still very active today, wears a moustache (see below). A defining element of the traditional costume of Crete, which nowadays you will only see worn by the dancers at special occasions and high up in the remote mountain villages, is the black headscarf known as a sariki. Sarikia are hand-woven and hand-knotted in the mountain villages. Ask the ladies to show you how they do it. They are made of special material. A good place to find them is the mountain town of Anogia. Still handmade and worn with great pride, are Cretan boots. These are generally black, for everyday use, and white are now used for dances and special occasions. These boots are made from leather, for each person individually, by a master craftsman. You must sit to have your own fitting done. These boots are called stivania. They are very practical for the rough mountainous terrain and tough weather conditions of the farmers, shepherds and workmen of Crete. The stivania are made with flexibility around the ankle, and over time form creases around that area. This is one way you can tell if a Cretan man is wearing his stivania or just a modern work boot. In Chania town is an area called Stivanádika the \'stivania workshops\', where the boots are made. Or visit the Irakliote village of Agia Varvara and ask for the tsogári, the bootmaker. Because these are hand-made and individual leather boots made to last, expect to pay for their value. The best way to see Cretan men wearing moustakia sarikia and stivania is at a village wedding, or high in the mountain villages and especially in Sfakia.